Supra’s Spring Line is stacked with updated colorways from all your favorite models. 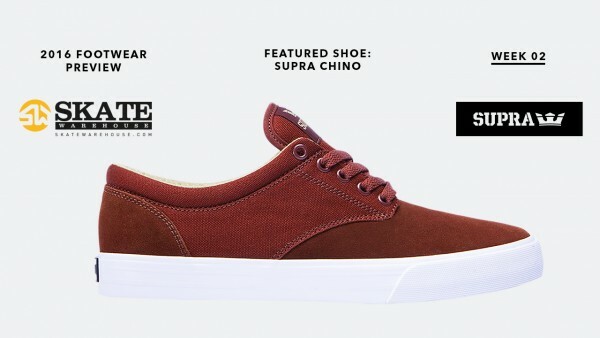 And for our 2016 Footwear Guide presented by Skate Warehouse we decided to highlight The Chino as it’s currently becoming one of Supra’s staple shoes. Its simple yet sturdy design is easy on the eyes and provides a great deal of comfort for your feet. A favorite among many of the Supra riders, (Boo Johnson, Dee Ostrander, and Oscar Candon have their own signature colorways), the Chino is a necessity for every skate shops shoe wall. Hands down! Its straightforward design is built for skateboarding and offers a modern take on timeless vulcanized skate shoes in an upper comprised of a clean vamp and uninterrupted expanses of material. A lightly padded collar and tongue and a dual density EVA insole provide ample comfort and protection while a vulcanized sole of SUPRA tread ensures superior grip. So whether you're cruising down the sidewalk or getting buck in the streets, this shoe has you covered. But as always, don’t take our word for it! Watch some of the best put the Chino to the test in the videos below.